The French capital, Paris, is to host an electric car rental scheme in the same vein as London’s Barclays Cycle Hire scheme. But Alex Blackburne asks would a four-wheeled version be a success in our very own capital? A new scheme begins in Paris today, which allows individuals to rent electric cars on a pay-as-you-drive basis, in a bid to cut pollution and reduce traffic. The scheme, which works in a similar way to London’s Barclays Cycle Hire, will allow Parisians to hire the fully electric Autolib cars for a cost of just €10 a day or €15 a week, with over 1,200 parking and recharging spots to choose from across the French capital. The announcement from our neighbours across the Channel is just another example in a long line of stories detailing how other European countries are stepping their games up in terms of helping the environment. First, Scotland announced its intention to trial an innovative wind turbine as part of its ambitious bid to become 100% renewable by 2020. Then, mirroring the Scots’ bold target, Denmark, already the world leaders in wind power, said its energy would similarly be 100% renewably sourced, but this time by 2050. And, more recently, Blue & Green Tomorrow wrote how Germany, historical foes of the UK, and the undisputed heavyweights in renewable energy, could teach us a thing or two. With the threat of being left behind in the alternative, clean energy stakes, is it possible for London to adopt a similar scheme to that of the French electric car rental one? Some in the industry claim it is. “It would be an excellent scheme for London, rather like the bike scheme has been”, Nick Hewson, founder of electric car specialists, GoinGreen, said. However, as much as the idea might be fantastic in principle, the actual logistics of implementing such a scheme in London are somewhat tricky. “The first barrier is the infrastructure: there isn’t currently that many charging points“, claimed James Finlayson, managing director at City Car Club, an organisation that rents cars out by the hour as an alternative to car ownership. “Of course, that has a massive cost implication as well, and in this economic climate, I doubt whether there is going to be the appetite to afford hundreds or thousands of charging points across London. City Car Club, which rents out 600 vehicles across 14 different UK cities, and has 23,000 members, is arguably the closest thing the UK currently has to the Parisian electric car rental scheme. 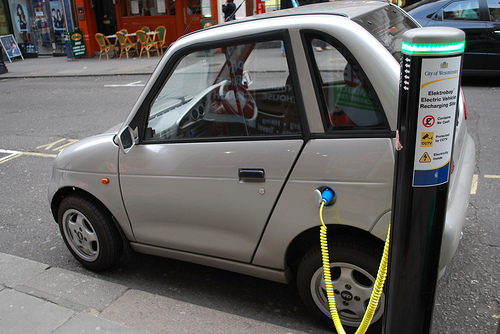 Finlayson, who currently provides around 100 hybrid vehicles through City Car Club, though none completely electric, added that the idea of implementing an electric fleet of rental vehicles in London is at least five years down the line. “Commercially, we would need to see the cost of electric vehicles come down a bit, because they are hugely expensive in relation to a comparable combustion engine vehicle”, he said. “The other barrier also, practically, for our members, is the downtime with charging. Finlayson is probably right. Introducing a scheme similar to the Parisian one would take a lot of effort and co-operation from individuals, businesses and local authorities. The long term advantages for electric cars, as long as their energy is sourced renewably and not from fossil fuels, are unquestionably imperative to the long term future of the planet. It might be worth making that sacrifice and putting in that much-needed effort, however much time that might take, in order to bring the UK, and ideally every other major city in the world, up to speed with the needs of the Earth’s future. If you would like to find out more about investing in sustainable transport, ask your financial adviser, if you have one, or complete our online form and we’ll connect you with a specialist ethical adviser.